The Dytran 3583BT triaxial accelerometer is helping provide a smooth ride and calm sailing experience on boats. Dytran’s 3583BT is used for vibration measurements in anti-roll gyro stabilisation systems for commercial and recreational boats. These systems use gyroscope and flywheel technology to act as a counterbalance to marine turbulence. The systems automatically gauge the ocean’s state and react instantaneously to turbulence by activating the flywheel, which can spin at speeds of up to 896km per hour, generating enough force to stop a boat from rolling. The 3583BT is an IEPE triaxial accelerometer with a high sensitivity of 500 mV/g, incorporating miniature ceramic shear mode sensing elements, mounted to a single support, packaged in a welded titanium housing, and weighing a total of 27 grams. The precision of Dytran’s 3583BT’s 500mV/g sensitivity range allows it to detect vibration levels when the gyroscope and flywheel technologies of the anti-roll system are engaged, making sure the system’s vibrations are within normal limits and don't contribute to the ship’s overall vibration signature. 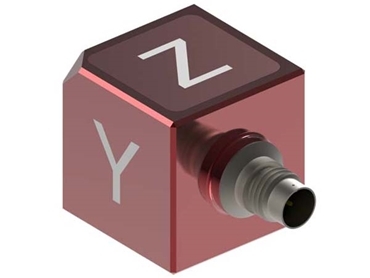 Dytran’s IEPE triaxial accelerometers find application in modal and structural analysis; Noise, Vibration and Harshness (NVH); squeak and rattle; vibration control; and general purpose triaxial vibration measurements. Dytran is distributed by Metromatics in Australia and New Zealand.